*This bag is written in collaboration with Lily Jade. I received this bag in exchange for an honest review. As always all thoughts and opinions are my own. 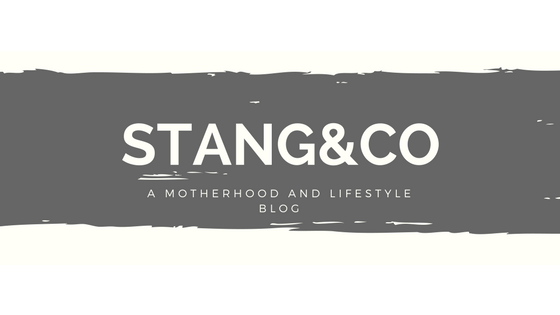 Thank you for supporting the brands that support Stang&Co! This summer has been an exciting one. Not only are the boys finally getting to a stage where we don’t need to hover over them every second that they are outside, but we also got the huge surprise of my in-laws buying a lake place! Up until now, we had never done a night away with BOTH boys, and had only done ONE night away with Jackson as a baby. Truly, neither boy has ever spent the night at a place besides our home and their grandparents. We were about as excited as you could be when we finally got to pack our bags and head up to the lake for a week earlier this month! Of course, with time spent away also comes packing. I was able to snag what is possibly my favorite Lily Jade bag to date (you can read about my other bag that I love here). This bag comes from Lily Jade’s new line of lifestyle bags. 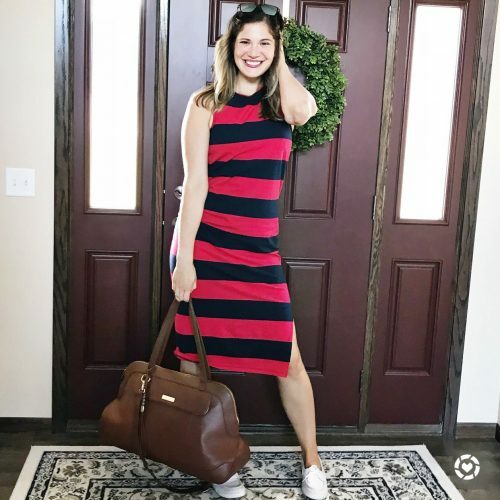 I have loved their diaper bags from day one, but as we draw closer and closer to NOT having diapers in our home anymore, I have loved the freedom of getting bags for myself that aren’t solely dedicated to carrying baby items. Keep reading for my five favorite elements of the Lily Jade Weekender bag! 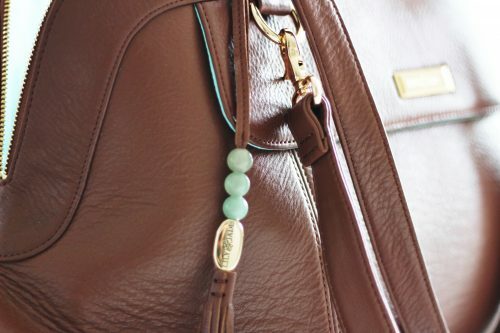 This bag follows through on the traditional Lily Jade design, down to the traditional beaded tassel on the front. The brandy color is a classic and goes with absolutely everything. It is just one of those colors that will never go out of style. 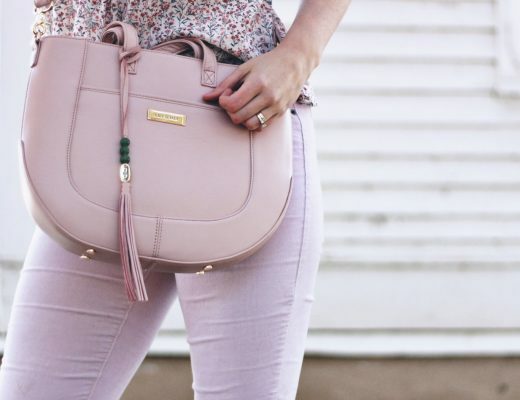 I love how stylish this bag feels, even if I am just packing lots of casual clothes as we head out to the lake! This bag makes me feel put together, even if my hair is a mess and my only outfit of the day is a swimsuit. Whenever I pack, I always like to separate out a few items. There is nothing worse than sorting through a big bag of clothing trying to find intimates, hair accessories, etc. The Lily Jade weekender bag has multiple small pockets on the inside, which I use to store those items that I don’t want to need to go digging for later. When I travel I tend to break out my storage by intimates, clothing, and personal care items. I use a small bag for toothpaste, deodorant, and other items. Bonus points because it fits perfectly into the larger bag. Then, I utilize the pockets for intimates. 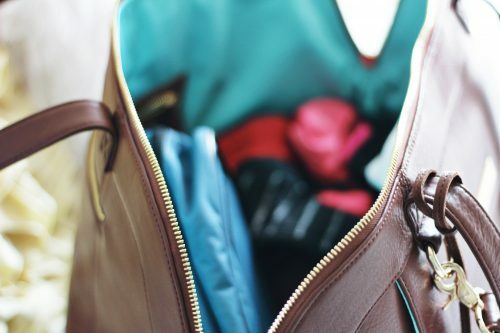 Have you ever been traveling and had to pretty much empty out your bag to find those smaller items?! Keeping them tucked into the roomy pockets of the Lily Jade weekender bag makes it so easy when I quickly need to get dressed. I think this one goes without saying, but when you are packing for a few days away, you want room to pack ALL. OF. THE. THINGS. We were at the lake for five days, and I had plenty of room to fit everything I needed, including one too many swimsuits and outfit changes. Because you never know what you might want to wear, right!? 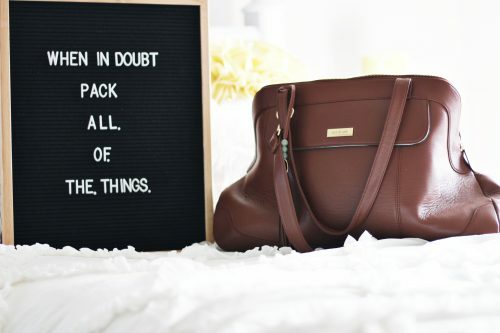 With this bag, I don’t feel guilty packing an extra outfit or two. I honestly go crazy when I travel and don’t feel like I have a choice in what I get to wear. So having space for extra outfit options is one of the best things about this bag! I also have used this bag for busy days at work. Sometimes I swear I am trying to carry three or more bags out the door in the morning, and it gets so stressful! I can fit my smaller purse, work computer, and clothes for the gym all in the bag! And it looks so chic for the office! 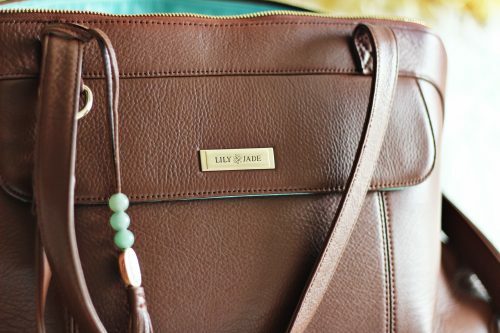 I love that the Lily Jade weekender bag has a removable strap, just like all of the other Lily Jade bags. When we are only traveling for a night and I am packing light, I have no problem carrying this bag by the handles. But on those longer trips where the bag gets heavy, the shoulder strap is absolutely essential. I love that it can be removed so it doesn’t get in the way on those trips where I don’t feel it is necessary! On the other end , I love having the strap attached when I have a busy day. When I have the bag packed full, it is so nice to throw it over my shoulder and feel the weight of ALL. OF. THE. THINGS. a little bit less. Lily Jade bags are truly some of the best quality bags I have ever used. They are built to last for baby and beyond, so even if you purchase a diaper bag, you can remove the insert and use it as a purse for ‘after the baby years’. All of their bags, including the Lily Jade weekender, are made of high quality hardware and full grain leather. I have not always seen the value of investing in higher end bags. However, after two babies and LOTS of use, these bags stand the test of time. I get compliments every single time I carry a Lily Jade bag, because they are just so gorgeous and made of the absolute best materials. 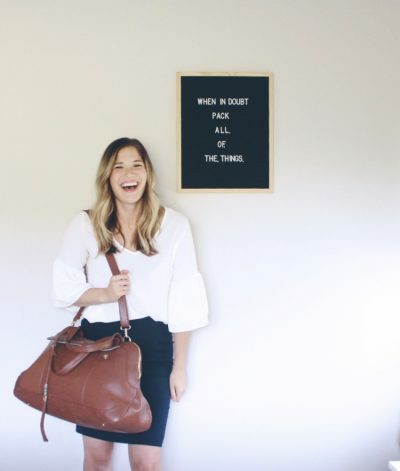 This Lily Jade weekender bag really is the perfect item for your travels, heading to the office, or just busy days where you are out and about. I have been a loyal user of Lily Jade for awhile now (see my review of their Brittany bag), and there is a reason why. 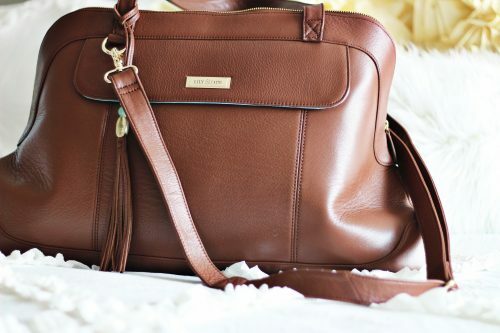 Their bags are top notch, and absolutely gorgeous! Do you use a weekender bag when you travel? What are your tips and tricks to packing for a quick getaway!? I’ve always heard amazing things about those bags! I love the color of the one you have.